As a new teacher, bringing work home every weekend was a fact of life. Now that I have a dozen years of teaching experience under my belt, I try to limit my weekend work sessions to once or twice a month. This weekend was one declared a working weekend. One of the major tasks on my to do list was updating my daily warm-up PowerPoint. A few years ago I switched textbooks. One of the major drawbacks of the new textbook is that it does not include an appropriate grammar program. While grammar is covered, the layout of the program is not linear and assumes that the students come to me with a firmer foundation than they actually do. Determined to make grammar instruction deliberate and not reactionary, I began my search two years ago for a program that I could implement everyday, preferably as a warm-up. 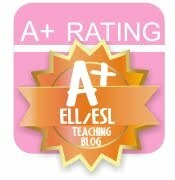 Since grammar can become a dry subject very quickly, I wanted the content to be appealing to middle school students. I found my answer in Caught'ya! 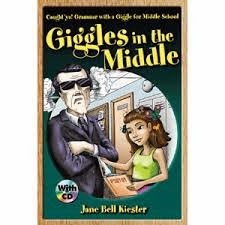 Grammar with a Giggle for Middle School: Giggles in the Middle (Kiester, 2006). For the mere price of $20, I have access to three years worth of daily grammar warm-ups. Each warm-up is a portion of a serial story. As soon as my students walk into my classroom, they read the sentence or sentences about the adventures at Horribly Hard Middle School and re-write them with correct capitalization, punctuation and spelling. They also study the challenge vocabulary that can be found in each warm-up and practice using context clues to unlock their meaning. The program takes up about ten minutes of class time per day to implement and has made a tremendous difference in my students' writing. It has made them more conscientious and less dependent on me to edit their paper for small errors. This means that I spend more time helping students bring their writing to the next level and less time correcting lower-case i's. That alone is worth $20.